There are many different types of building signs and depending on how you want to advertise your business, we can make different styles of signs that will suit your marketing goals. Morton Capital Management is a wealth management company with an office in Calabasas, California. We removed their existing sign, had the area patched and painted, and manufactured, permitted, and installed a brand new sign for them with their new logo. They wanted the sign to be visible at nighttime so we made them a reverse-lit channel letter sign. Even if your business isn’t open 24/7, having your business advertised 24/7 is never a bad thing. Large, lighted signs like these can serve as landmarks for the community and it doesn’t hurt to have your business name illuminated for all to see. 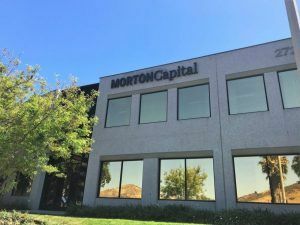 Morton Capital Management is a major tenant in a large office building and they had us update a monument sign along with this channel letter sign. It was important to them that their business was visible all day and all night. Many professional businesses will have a channel letter sign. Many of the businesses advertised on skyscrapers downtown aren’t open at night, but their signs are on all night and they are now a prominent part of the city skyline. Outdoor signs are a crucial part of your business if you have clients that come visit your office in person. Not all tenants of office buildings are able to put up a building sign. If you don’t have building space to put a sign up, a multi-tenant monument sign is a great way to list all of the tenants in a building. These are signs installed in the ground, typically installed near the street, that list all of the tenants that are in a specific building or plaza. No matter what your situation is, we can help you with a sign that will make sure that your business is seen.